First Grade Worksheets Can Be Fun! Our First Grade worksheets are free printable worksheets that you can use to teach the basics or reinforce what your child has learned at school or in a home school curriculum. Practice is key here. 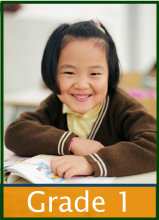 Our practice worksheets for First Grade include free printable worksheets with lovely elementary themes. You can go to other grades and subjects for more practice worksheets for slower or faster students. This is where we link our main or new First Grade printables. First Grade is one of those years when many children "catch up". They mature and they "catch on" to what they may have been hearing and practicing for years. Be encouraged to offer review. Counting is first. 10. 20. 100. Addition is fast counting and subtraction undoes it. Practice plenty. Flash cards. Worksheets. Videos. If your students say what they write they'll learn it better. Repetition brings automaticity! Say it! Write it! Repeat it! 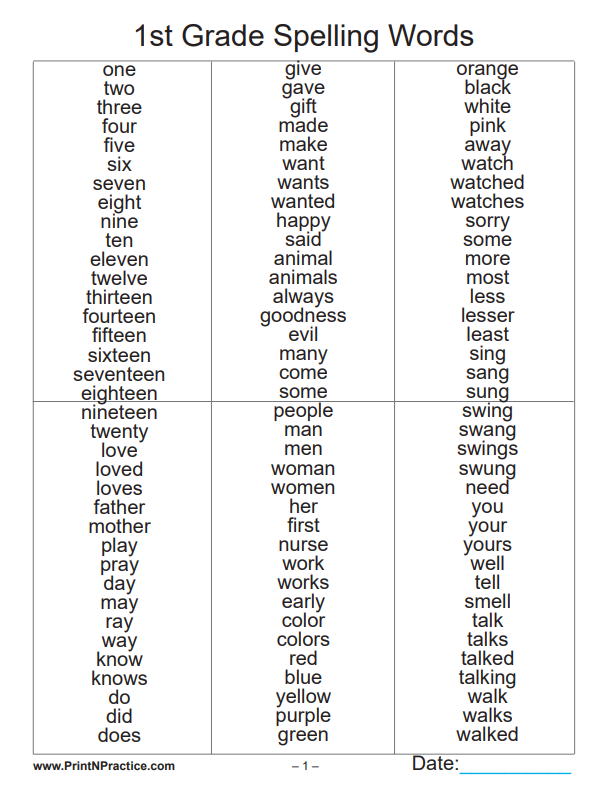 Our reading worksheets may be used by the teacher to read to the students or by the students for reading comprehension. If the teacher reads the story, you can get an idea of the child's listening comprehension by the details in the picture he draws. We would not put too much emphasis on having a work of art. The idea is to enjoy the story and "tell it back", not to produce a meticulous work of art. If you find that this is frustrating and not fun, talk about the story and suggest ideas to put down on paper – or suggest shapes with which to begin. 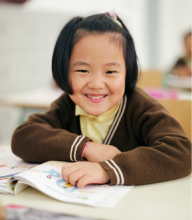 The first grade reading worksheets have room for drawing and/or coloring the main ideas. You can use them to read to those students who are not quite able to read this level for listening comprehension exercises. 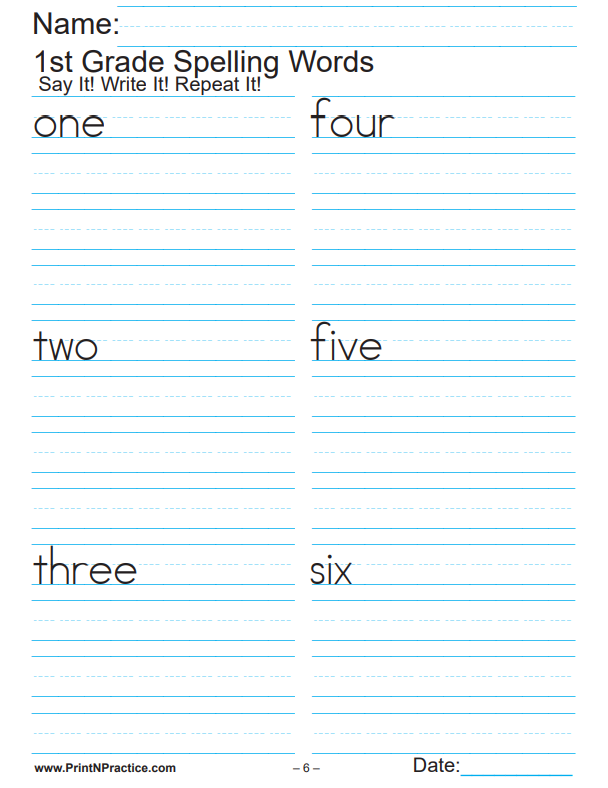 You'll love our phonics and phonogram worksheets for spelling, too. 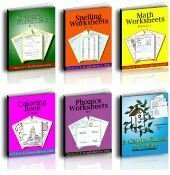 You can buy them complete with all our K-6 spelling worksheets in one bundle with convenient files. Our first grade math worksheets have space for your students to copy the equations for all twelve tables three times for each equation. They cover counting and skip counting. They also cover addition and subtraction with pictures of blocks, reference sheets for the addition and subtraction tables, and the ways to make a number. There are skill builders for all of the above and also for showing the relation between addition and subtraction. Many elementary worksheets are simply quizzes! We believe that it is important to build the basics first. So many times we find it true that children do not have enough time to practice the basics. Also, it is hard for teachers and parents to set aside time to drill individual children with the practice that they need. Use our first grade worksheets, flash cards, and videos to fill in the gaps where you need help. The same is true for our Phonics Worksheets. When you are teaching a particular sound like "wh" or "th" you can print our matching worksheets for words to practice those sounds. Saying the facts out loud further reinforces the learning and cuts the time necessary to learn the facts. You might also like my thoughts about teaching the alphabet. Fill in the gaps with our printable flash cards and videos for both Math and Phonics as well as hundreds of fun coloring pages to print. Thank you for visiting and for sharing our printable first grade worksheets!